You’ve got a special item or project in mind and you’re not sure where to start. You might try what we all do today and head to the internet. Maybe you hunt down the local speciality store, or even check the big box stores. How about hiring a local maker to help you with your project? If you’ve never commissioned work before, this can sound intimidating. How do you find the right person, and what are the steps to turn your idea into reality? There are hundreds of local makers all over town working in every material or media you can imagine who would love to work with you to create that perfect item. Here’s how to do it! 1) Find a maker. Ask around. Friends, neighbors, or co-workers might have worked with someone who can help you. It’s easier to trust someone your friends have worked with, and it takes a lot of the stress out of the decision. If that doesn’t get results, check the new and rapidly growing Richmond “Find a Maker” Directory! You’ll find specialists, makers, and service providers of all sorts there. Check it out, https://rvamakers.wildapricot.org/. 2) Know your specifics ahead of time. Gather ideas and inspiration for your idea around your needs, your decor, colors, etc. You’ll need to be able to describe or roughly sketch your idea for your maker, including a rough idea of the measurements. Have a realistic sense of your budget. You should expect to pay more for custom work than off-the-shelf items. However, you can also expect a much higher quality finished product. And many times makers can work with your budget if you are honest and flexible. 3) Approach the maker. Contact the maker by phone or email. Makers will take your request more seriously by these methods than social media messaging or texting. Depending on the size of the project and personal preference, they may take specifications over phone or email, or they might need to meet in person or on-site. In-person or on-site meetings may include a charge for that time, depending on the nature of the work needed. 4) Decide on the design of the finished product. Sharing three or four important details with the maker is often a good place to start. These can be broad ideas or related sources of inspiration. Bear in mind that too many ideas, specifications, and involved decision makers can weaken the final design. You’re more likely to be pleased with the result if you can allow your maker freedom, flexibility, and creativity. The maker may want to take measurements, photos, or other information to guide the design. Once you’ve selected a maker you’re comfortable with, trust their professional training and experience to guide the design process. 5) Make it official. This may be a contract or an online sale. Your maker may take checks in the mail or send you an invoice you can pay with a card. You will pay a deposit to cover the maker’s expenses to create your item. Often it’s 50% up front, 50% on delivery. For longer or bigger projects, it may be divided into more payments, such as 50% up front, 25% partway through the process, and 25% on delivery. Whatever their process, your maker will guide you through the steps. 6) Delivery. Turnaround time varies by maker, item, time of year, and other factors. Allow plenty of time for delivery. If you have a particular date in mind such as a birthday, holiday, or other event, be sure to find out your makers usual turnaround time so you can place your order with plenty of time for them to create your item. 7) Savor and enjoy! Your maker will surely appreciate a photo and a tag on social media. And be sure to tell your friends who created this beautiful custom item for you! Johannah Willsey is a visual artist and co-owner of Phoenix Handcraft, a design studio specializing in handmade works in metal, mosaic, & wood. 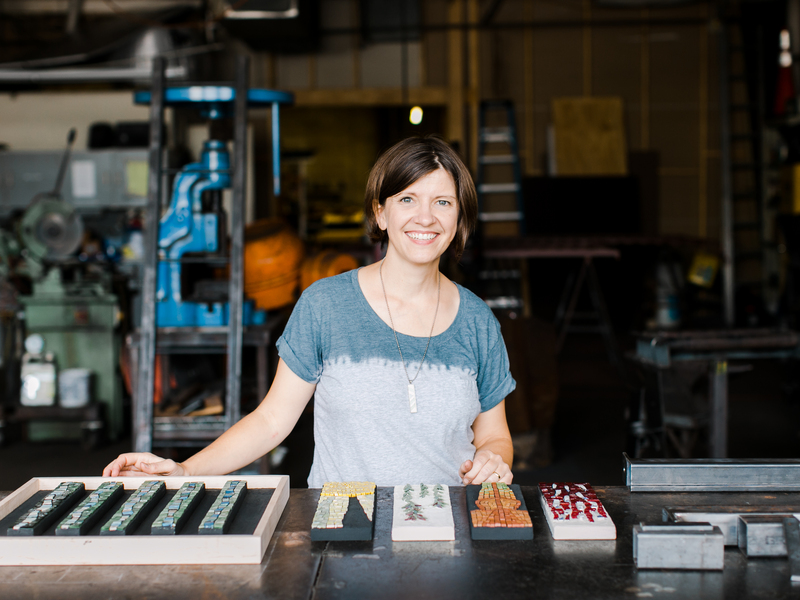 She works to support local makers and artists through her role as a cofounder of RVA Makers and member of the Richmond Craft Mafia. Johannah is passionate about fostering community, exploring outdoor Richmond, and homeschooling her two children.